Today, we will compare the best synthesizer choices you have at your disposal at the moment. Our reviews will be based on the accuracy of instrument imitations, build quality of each synthesizer, and the overall user interface. Synthesizers are electronic instruments utilized in private studios and live performances to produce digital music. These instruments generate the sounds of traditional instruments by converting electric signals through amplifiers or another speaker source. In the table below, you will find our top five choices for the best synthesizer that impressed our editors through their features. 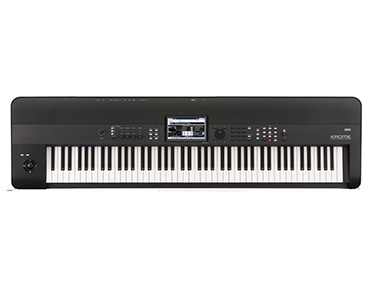 The Roland FA-07 workstation offers a fast workflow with a variety of features. It is equipped with 76 weighted action keys. Thanks to its vast selection of realistic instrument sounds, you can perform and record high-quality audio for future listening. 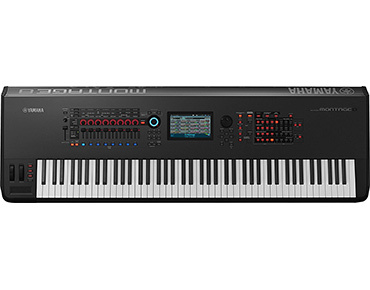 The Roland FA-07 allows you to maneuver through a multifaceted keyboard setup with multiple integrated split zones. The user interface is comprised of a large color LCD screen for easy navigation. This workstation houses over 2000 flagship INTEGRA-7 sounds that include the SuperNATURAL synth. Over 2000 flagship INTEGRA-7 sounds. Small touchpads with no sensitivity. The SuperNATURAL synth can be used with a collection of INTEGRA-7 tones and drum samples. Only two virtual expansion slots. This compact, portable workstation is packed with a massive bank of sounds. 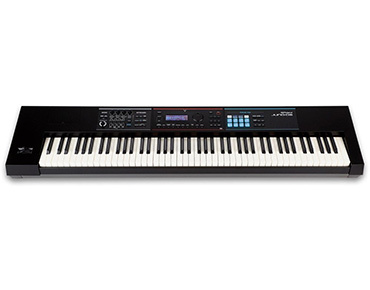 The Korg KROSS is lightweight with the ability to run on batteries alone. This synthesizer has a new pad sampler that allows you to mold sounds to your unique style. 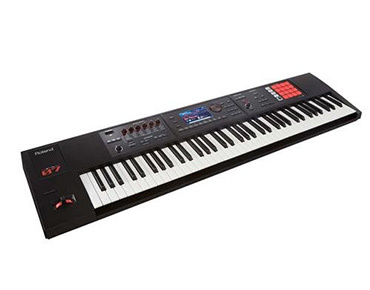 The Korg Kross was designed to come in a variety of colors such as matte black, red marble, and dark blue. Lightweight. Batteries need to be charged after six hours of use. Up to 120 voice polyphony. Small pitch and modulation wheel. Up to 16 combination timbres. Small screen may be hard to read. 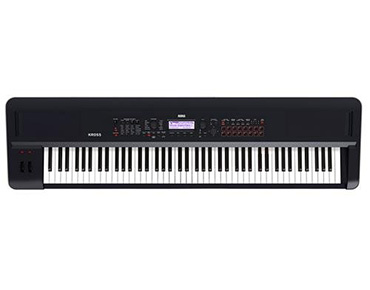 The MX88 synthesizer by Yamaha has 88 GHS weighted action keys. The Graded Hammer Action keys vary in weight depending on whether the keys are high or low. The response for the lower keys is heavier than that of the higher key. The matte black keys are designed to absorb moisture while playing to offer extended playing times. 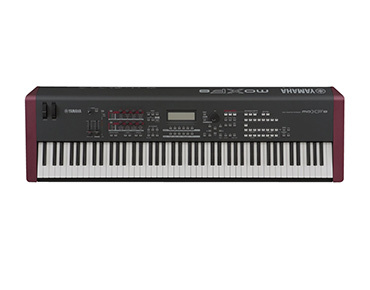 The Yamaha MX88 synthesizer is equipped with the sampled Full Concert Grand Piano from the Yamaha MOTIF series. Over 1000 onboard voices from the MOTIF. The Roland JUNO-DS88 is a lightweight, portable synthesizer. The 88 keys are weighted action resembling an authentic grand piano. This synth has on-board realistic sounds of drums, guitars, bass guitars, and other instruments. The JUNO-DS88 has its own audio interface that allows you to record and sync audio compositions to your computer. MIDI controller. No loop recording. 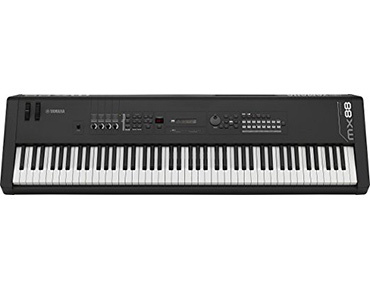 The keyboard of the Korg KROME 88 has Natural Weighted Hammer Action keys. The body of the KROME is dark in color with the top panel being made of two different aluminum designs. The TouchView Color display is large with finger dragging capabilities. This synthesizer can be connected to your computer to use as a MIDI controller and for transferring MIDI files to your device. USB and SD storage. Some customers said that they had encountered some trouble with the sensitivity of the keys/pads. The MOXF8 is a synthesizer packed with 10 years of MOTIF sounds. With this instrument, you are capable of producing, playing, and performing music with its database of instrument voices. The interface is user-friendly with different modes to navigate through. The body is light and easy to carry with 88 Graded Hammer Standard Action keys. This synthesizer weighs in at 32.9 pounds and has a two-tone body finish. Complete with bundle production software. Plastic casing. Built-in sequencer. Only 44k sample rate. 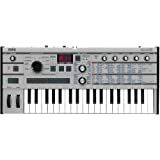 The Korg ARP Odyssey 37 is an analog synthesizer that is portable and easy to play with a slim, compact body. 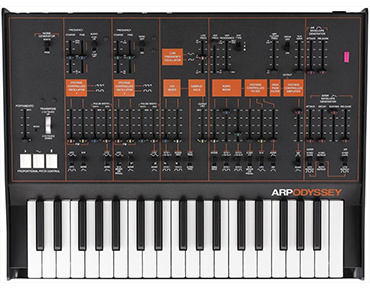 It produces sounds from the unique tunes heard from the original ARP Odyssey. Pitch and pulse modulation can be controlled by the onboard sliders. The hardware has a duo-phonic design that allows two notes to sound at once when played. Its overtones are sharp and extend throughout the instruments high range. MIDI connections. Doesn’t play chords. 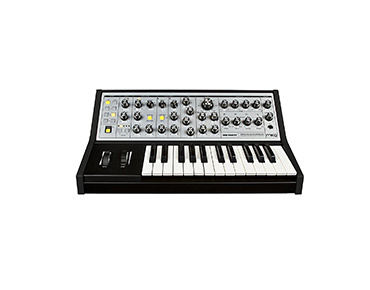 The Moog Sub Phatty is stocked with 25 full-size synth action keys. The design features 16 presets within the panel. The panel houses 31 controllable knobs on the front panel that offers the best synthesizer control abilities. This instrument produces crystal clear sounds and requires little to no time to warm up. The Sub Phatty features the Multidrive section which opens up possibilities to add warmth and girth to your sound. Such a model is the first analog synth by Moog to be in possession of this element. Comes with a gig bag. One knob per function isn’t available. Great for learning. Limited presets. 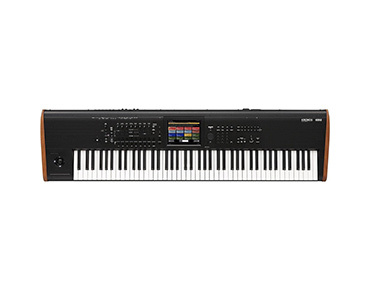 The Korg Kronos2 easily offers the best synthesizer features for enthusiastic musicians. It has onboard effects to transform internal and external sounds into an amazing finished product. Originally available in black, the Kronos now comes in a limited-edition gold finish as well. It is equipped with nine authentic sound engines, allowing it to perform as a stand-alone synthesizer. Nine sound engines. All users found the product spotless, yet the provider delivered the asset with some tear and scratches. Fast search options and touch screen display. As the best synthesizer, the Motion Control Synthesis Engine of the Montage8 regulates the two onboard sound engines. The body is equipped with the Super Knob. This enables you to control multiple sound parameters at once. You can instantly change your listening position and overall atmospheres through the use of the Super Knob. Pure analog circuit. No sequencer features. As producers of music, we want to have superb sounds to match our compositions. 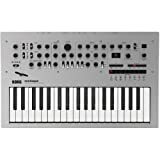 This is a compiled list of the best synthesizer choices you can acquire to meet your desired musical preferences. Follow each review to discover what each instrument has to offer. 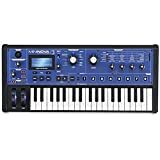 As you search for the synthesizer to aid in your future music productions, narrow down your options by comparing the features of each device.